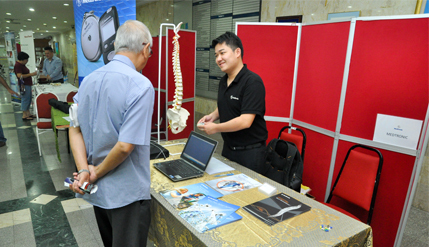 KUALA LUMPUR, 15 September 2014 – Chronic Pain which affects 7% of patients in the country is best dealt with through self-help pain management techniques rather than surgery or pain killers. That was the message given by specialists at a Public Forum On Chronic Pain organised by The National University of Malaysia Medical Centre (UKMMC) here today. The specialists were Anesthesiology Consultant at Selayang Hospital Dr Mary Suma Cardosa, Anesthesiology Consultant at UKMMC Prof Dr Choy Yin Choy, Neurosugery Consultant at UKMMC Dr Toh Chang Jeng and Associate Prof Normah Che Din of UKM’s Research Centre For Healthcare Science. Prof Raymond and the other specialists encouraged patients to follow a regime of exercise and therapy that would help ease the pain. Dr Mary said there was no guarantee that surgery would stop the pain permanently, as it might recur. As for painkillers, they only make the patient increasingly dependent on medication and it is only for a brief period before the patient would need more pills. She explained that chronic pain is pain that lasts for longer than three to six months and not related to cancer. Unlike pain due to injury or treatment that recedes after healing, chronic pain goes beyond the healing period when the tissue or muscles already healed. Other problems include back pain, athritis and neuropathic pain among others. “There can be many causes but when chronic pain is no longer a symptom of tissue damage it becomes a disease in itself,” she said. Dr Mary said she has seen many chronic pain cases in her duties at Selayang Hospital where the patients did not show anything wrong under thorough examination including MRI (magnetic resonance imaging) scanning but they still continuously fell excruciating pain. She recommended self-help at home to help relieve the pain by doing exercises as prescribed by physicians as the best way to deal with it. Merely resting would not help as the patient would still be thinking about the pain. Prof Choy said pain is one of the most common reasons why people seek medical treatment. Experience all over the world show that pain is still not well managed. “Many barriers of pain management have been identified and failure of healthcare providers to assess and document pain has been one of the major barriers to pain relief. Pain management can be improved with education of healthcare providers and their partners,” he said. The Department of Anaesthesiology and Intensive Care Centre and The Malaysian Association for the Study of Pain have made a joint effort to promote better quality in pain management by improving the knowledge and skills of healthcare providers with regards to acute and chronic pain management. He said it was important to understand the principle in achieving effective results and patient safety urging patients to take part in exercise sessions and workshops where participants can gain practical experiences and tips on how to ensure pain management achieves the desired result. Dr Toh believed that techniques used to treat pain patients in conjunction with other treatments can produce better outcomes and reduce side effects. However, he said, not all surgeries are designed to cure chronic pain as many techniques are for diagnostic purposes. He cited headache and back-pain as some of the most common forms of chronic pain that he had personally dealt with. He also said that not all headaches originate from the head but could be caused by the neck, face or the jaw. In such cases, surgical intervention could be a solution. Doctors, he said, cannot eliminate chronic pain 100% and sometimes the pain is not a symptom anymore, but is a disease. The patient may have to live with the pain for the rest of his life. Dr Toh cited parasetamol, NSAIDS, codeine and tramadol as some of the oral pain-killers prescribed but warned that they only provide temporary relief. Dr Normah of the Health Sciences Faculty explained chronic pain can occur due to psychological conditions. A patient under stress can feel chronic pain and it becomes a vicious cycle in which the sufferers worry very much about the pain, lose sleep and their health declines. Worrying about it seemed to bring more pain, which in turn makes the patient even more anxious, and so it continues in a cycle. She said there are also psychosomatic conditions in which mental or emotional problems are the source of pain rather than due to physical illness. In such cases the best advice a doctor can give patients is for them to change their attitude and make them think more positively. Such psychotherapy and can be quite effective if the patients practice stress management and periodical relax sessions. That work by reducing the flow of hormones from the brain that causes stress or anxiety. UKMMC Physiotherapist Harjinder Singh Bains recommended physiotherapy for pain due to musculoskeletal imbalance and arthritis. Harjinder said many patients recovering from surgery can be greatly aided by physiotherapy because they have no other way to become physically active. He advised people recovering from operations to try to start walking in small paces and gradually increase activity over a course of several months. Public participants of the forum also took part in a demonstration of pain relief exercise and make appointments with doctors to consult on their pain problems.